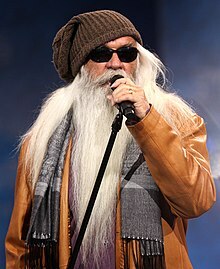 William Lee Golden (born January 12, 1939), a native of Brewton, Alabama, is an American country music singer. 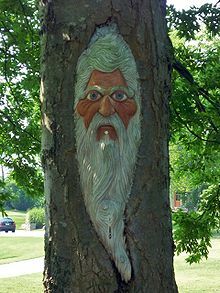 Between 1965 and 1987, and again since December 1995, he has been the baritone singer in the country vocal group The Oak Ridge Boys. 3 The "Golden Era Plantation"
Golden joined The Oak Ridge Boys (then a Southern gospel music group) in 1965. Golden is widely known for his waist-length beard and hair, and has become one of the most recognizable faces in the entertainment industry. Golden was voted out of The Oak Ridge Boys in 1987, as the other three members wanted to change the band's image. He was replaced by Steve Sanders, but stayed with MCA Records as a solo artist to record an album titled American Vagabond, which included two chart singles. In 1990, he moved to Mercury Records and released "Louisiana Red Dirt Highway". Sanders left the group in 1995 and Golden returned on New Year's Eve of the same year. Golden has married multiple times. One of his marriages ended in 1975 due to his infidelities. Golden married Luetta Callaway in 1984. He filed for divorce in 1987. Golden married Brenda Kaye Hall in 1990. They divorced in 2014. Golden married Simone De Staley in 2015. They live in Hendersonville, Tennessee. He has four sons, a step-daughter and seven grandchildren. Golden's sons Rusty and Chris recorded as The Goldens for Epic Records and Capitol Records between 1988 and 1991. They also played in his road band during his solo career. Golden's home is called The "Golden Era Plantation." Built in 1786, it is recognized as the oldest brick home in Sumner County, Tennessee. The Federal-style structure was built in 1786, then called "Pilot's Knob," on a military outpost by American Revolutionary War Captain James Franklin, the father of planter and slave trader Isaac Franklin (1789–1846). After the war, he was awarded a land grant to the property. During the Civil War, the Plantation became a station camp for Confederate soldiers. In order to protect their valuable gold and silver from approaching Union soldiers, the occupants buried the metals in the ground surrounding the house. This gold was later discovered during renovation of the home in 1976. The area has been struck twice by tornados; once in 1892 and again on April 6, 2006. Originally a two-story building, the second story was removed by the first tornado. Repairs were made leaving it as a single-story home. Following the second tornado, the home's architecture was restored, adding a second story. The home was listed for sale in 2016 following Golden's divorce from Brenda Hall. ^ a b c Peña, Susan L. (12 August 1994). "When it comes to country music, he's Golden". Reading Eagle. Retrieved 20 September 2011. ^ a b Whitburn, Joel (2008). Hot Country Songs 1944 to 2008. Record Research, Inc. p. 164. ISBN 0-89820-177-2. ^ McCall, Cheryl (April 25, 1983). "After Months on the Warpath, the Battling Oak Ridge Boys Pass the Peace Pipe". People. 19 (16). Retrieved 10 November 2018. ^ "Single Reviews" (PDF). Billboard. March 31, 1990. ^ "Single Reviews" (PDF). Billboard. August 11, 1990. "Biography." William Lee Golden. 25 October 2007. "Golden Era Plantation." William Lee Golden. 25 October 2007. "Trying to Love Two Women"
"I Wish You Could Have Turned My Head (And Left My Heart Alone)"
"I Guess It Never Hurts to Hurt Sometimes"
"Make My Life with You"
"Come On In (You Did the Best You Could Do)"
"It Takes a Little Rain (To Make Love Grow)"
"Gonna Take a Lot of River"
This page was last edited on 7 January 2019, at 03:41 (UTC).